Discussions Magazine Music Blog: SPAZ reviews THE WEEKLINGS! The music business may be fickle but beneath the excesses of ego, fame and fortune lies the heart and soul of Rock ‘n’ Roll’s roots. No matter how faceless the charts may be, you’ve still got Rock, Garage, Psych and Power Pop bands roaming the streets and setting things right. Real Rock musicians are super heroes to music fans all over the world – instead of capes, they’ve got their guitars, bass and drums to aid them in their never-ending battle to set Rock ‘n’ Roll right. For every Justin Beiber or Kanye West, there are 50 Rock combos playing their hearts out in sweaty and dark clubs, waiting for their time to strike. So, before anyone loses their faith in modern music, I’d like to introduce you to a ‘new’ band with their feet in the past, their pulse on the present and their sights on the future. I’ve heard the future of Rock ‘n’ Roll and it’s in mono! Ladies and gentlemen, its time you heard the fab Merseybeat sounds of The Weeklings and their self-titled album recorded in glorious monophonic sound! 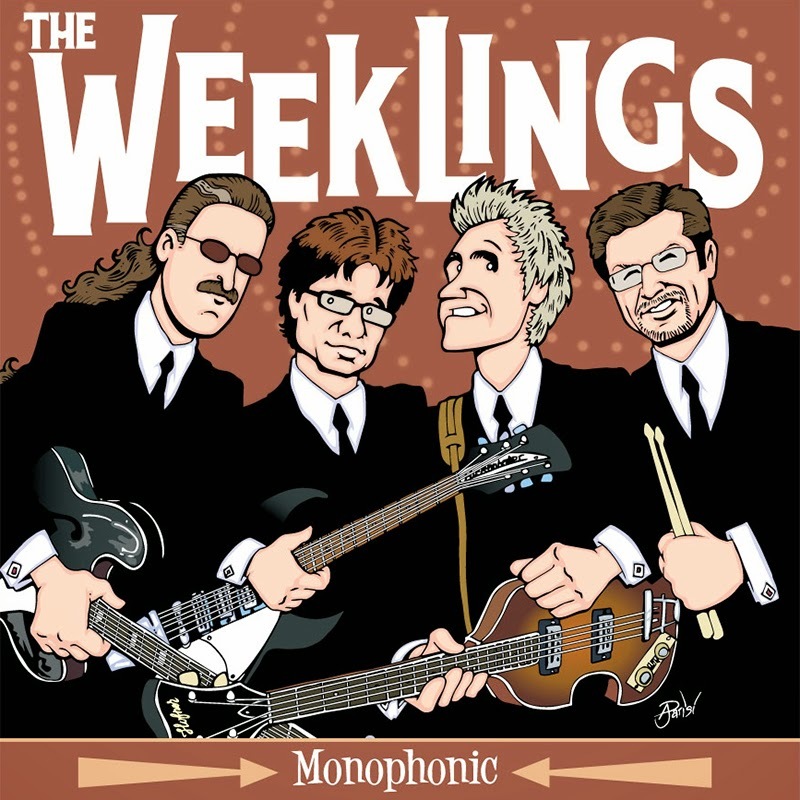 The Weeklings are four Pop brothers-in-arms with impressive pedigrees: Glen Burtnik (Lefty Weekling), Bob Burger (Zeek Weekling), John Merjave (Rocky Weekling) and Dave Anthony (Ramblin' Dave Weekling). All four members have served their time playing in everything from dead-end bands to backing some of the world’s biggest musicians. However, on their debut album, they bring the experiences of seasoned players and add an energy that can only be equaled by musicians half their age. The easiest way to describe The Weeklings is ‘Beatles influenced’ but that is an understatement. Like a long lost musical relic from 1964, this album embraces their love of The Beatles’ music while adding a sense of fun that sounds joyful and feels refreshing. The concept of the album is simple: take some of the Lennon & McCartney-penned tracks that the Beatles did NOT record, write some originals that sound like they could have been leftover Beatles tracks and record it all in mono. If you are immediately thinking of The Rutles, Utopia’s Face The Music, The Kaiser’s DIY Merseybeat-inspired albums and that Beatles cover band you saw playing on campus during your senior year in high school, then you are definitely on the right track. At the same time, The Weeklings’ debut sounds a lot more exciting than what you are imagining at this very moment. The Burtnik/Burger originals are splendid, the Lennon & McCartney tracks are lovingly performed and it all blends together very well. Beatles geeks are already going to know which songs are written by John and Paul, but I don’t want to spoil the party, so I’ll let you figure that out on your own (ie: don’t read the credits until AFTER you’ve given the album a spin!). I’d like to address some of the songs individually, but I’ll refrain for now. And trust me, if you are a Beatles or Power Pop fan, you are going to need this in your collection ASAP. The Weeklings contains 12 tasty slices of melodic bliss that will warm your heart and capture your imagination. The album takes you on a trip down memory lane although you’ve never been there before. It’s like opening portals in your brain and reliving the early to mid ‘60s all over again – the only difference is you’ve traded your Pampers for Depends!